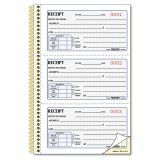 Account and check-off boxes for cash, check, money order. Coordinating gold twin-wire binding allows book to lie flat when open. Attached stop card prevents write-through onto other receipts and is always handy. Note: A minimum quantity of 44 must be ordered, and in units of 4 thereafter. 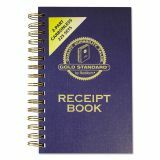 Rediform Money Receipt Book, 5 x 2 3/4, Two-Part Carbonless, 225 Sets/Book - Use carbonless receipt book for either money or rent receipts. Cover has a gold foil-stamp and a linen-look. Coordinating gold twin-wire binding lets book lie flat or fold completely underneath. Extra-thick 80 point backer increases writing stability. Stop card protector prevents write-through. 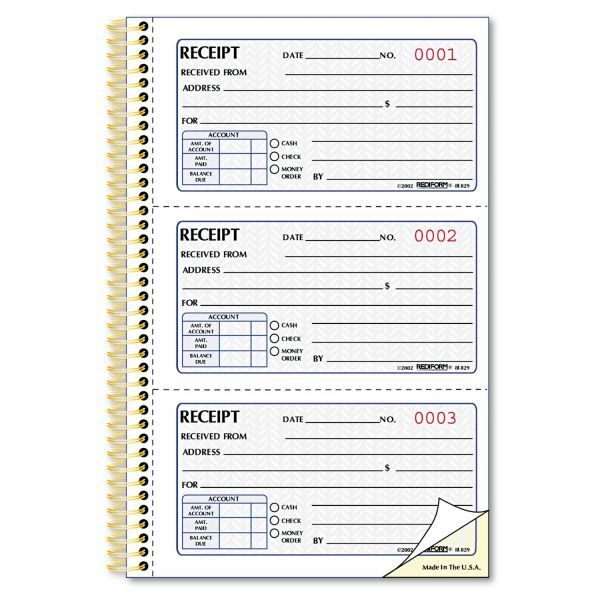 Receipt book offers two-part carbonless forms and three receipts per page. Receipt forms are consecutively numbered in red for quick reference. Security screen prevents alterations.